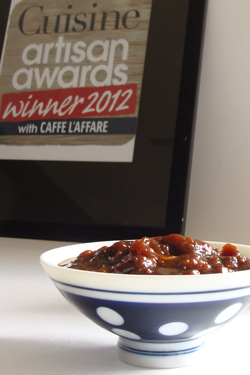 Jenny's Kitchen Tamarind Chutney was first created on Waiheke Island in 1998. It is still handmade in small batches with the same love and care as always. Each pot is hand stirred, each jar is hand poured. Jenny's Tamarind Chutney is addictive, and has developed a cult following with foodies who will track it down from the other ends of the earth. * What is a Tamarind Tree? We are often asked, so if you were wondering....a tamarind tree is a large canopy tree found in hot countries, bearing broad-bean like fruit pods of tamarind goodness. It is considered a 'fruit of the future' with a major part to play in reforestation plus providing shade, fruit, wood and income in many poorer communities globally. Available in Mild, Medium, Hot & Extra-hot in 300ml & 500ml jars. Proudly handmade in New Zealand by a NZ owned company.